Returning to the Digital World, Taiki and Shoutmon learn that the Bagra Army has taken it over and reformatted the world to have Seven Kingdoms, each ruled by a general. Technically, this is the second arc/part of the sixth season so you really need to watch the first one before you can hope to understand everything that's happening here. The story continues from where the first part left off and Taiki has returned to the Digimon World (from the real world) in order to stop bad guy Baguramon from destroying everything. He arrives to find that quite a few months have passed in the Digimon World since his departure(since time passes differently between the worlds) and Baguramon, during this time has reshaped the entire world to his liking and is preparing to initiate D5(kinda like a digimon apocalypse) which would result in him gaining control of both the Real/Digimon worlds and all dimensions. His lackeys, called the Death Generals, have each been appointed a certain area of the Digimon World where they will reigns supreme and each of them must be defeated before Taiki and his friends can even hope to face and stop Baguramon. The rest of the story is about how Taiki and his friends defeat the big baddy and save the worlds. Pretty cliche but executed nicely. Art is crisp as before and is basically a blend of the style of the older seasons and mecha shows in general. Since this series is focused on mecha fusion action, don't be surprised to see some of the ridiculous fusions/monsters you would find here. Also, unlike the first part, basic FANSERVICE is present in this one. Though, it must be added that it doesn't get in the way of important things. Sound is much, much better than before. The new tracks are very much likable and the opening "New World" is pretty good. Like the part before it, this part also lacks an ending song. Most of the fusion insert songs are really good. Not really the main focus of the story but yeah, there is character development. However, it is limited to the main cast and not every minor character but you won't miss that. And it is pretty basic at best so if you're going into this show for the character development, you might as well not watch it. Honestly, I've enjoyed it so much that I could swear the ending was better than the other Digimon seasons I've watched but your experience will vary. Depending on how much you know about Digimon and its monsters. You'd only appreciate it if you are somewhat familiar with Digimon/monster shows in general. It is not exactly made for someone new to the series so If you're new to Digimon, you're better off watching the earlier seasons.If however you are on the lookout for ridiculous/overblown action of the likes of Tengen Toppa Gurren Lagann(TTGL), you'd do well to check the series out. A nice series to get into if you're familiar with Digimon. Also, this is part 2 with regards to continuity so you'd need to watch the other part before heading here. If you don't care much about the monsters and are looking for overblown action in TTGL fashion, this one's for you! The sixth season! Well, technically I guess this would be the seventh since this one was split into two different shows, but it's the same characters/story anyway. If you haven't watched the first season of this show there's really no point in watching this one. So if you were expecting this season to have a few digidestined and partner digimon that gradually get stronger throughout the show you were dead wrong. This entire show focuses more on the "Xros [Cross] Fusion" rather than the normal rankings of Digimon (Rookie>Champion>Ultimate>Mega [Dub]). There really are no rankings actually. They don't look at an enemy and panic because it's a Mega level, but I digress. Taiki heads back into the Digital World, minus his two useless friends, and learns upon returning that 7 Death Generals have taken control of different zones in the Digital World. Interesting and cliche, eh? Story: So yes, Taiki and Shoutmon return to the Digital World, meet up with old friends, learn what has been going on, and discover they have to defeat the 7 Death Generals in each zone in order to reach the ultimate bad guy boss, Bagramon. The story itself had potential. Yes, it's a pretty basic storyline, but it's also a kids show. If they had actually stuck to what makes Digimon, well, Digimon, then it would have been a different story. The whole Xros Fusion stick didn't really make the show interesting. 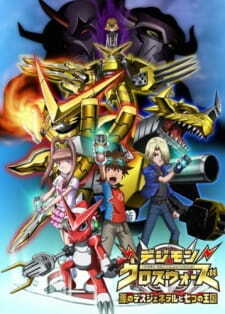 They just keep combining more and more Digimon together in order to defeat the enemy. While I haven't finished the show yet (2 episodes to go), I doubt those 2 episodes will change my mind on this show. Character: When I enjoy a show, it typically involves my enjoyment for a particular character. Unfortunately, I don't really like any character in this show. The main kid, Taiki, is really annoying. He's a total optimist and never wants to give up on someone. Boooooring. The other two characters, Nene and Kiriha, are of course different in personality, but they bring nothing interesting to the show. Nene, the girl, begins to trust the team more as she continues her search for her brother in the Digital World. Kiriha also becomes more trusting to the group, but he's still fitting the role of the "anti-hero" until the last bunch of episodes. Enjoyment: I would have preferred this show a lot more if each human had their own partner digimon that gradually became stronger as the show went on. Sure, you could say that's typical if they need to evolve to Ultimate in order to beat an Ultimate, but that's what makes Digimon - the franchise.